This is another interesting concept and ICO launches soon. It is an open-source framework and consensus protocol that makes blockchains usable and scalable for the mass market, by creating a decentralized software ecosystem. The video explains it pretty nicely. Since the system is very complex and has many layers, unlike most ICOs this one has extra papers explaining each of system cores in detail. Short fast-forward technology is shown below. You can watch CEO explaning whole idea in an interview. Soon the ICO will be opened but you still have time. Its projected for Q1 of 2018. Always do research before investing! I still don’t understand. Can you give a couple sentences so I can see if I should watch the video. Hey thats actually a smart idea, thanks for sharing this ico, any airdrops do u know? thanks for your informative share, it sounds good. Interesting. Do you think that users will have self sovereign identity in this environment? Thanks! How does SUB look for you? The crypto market may be crazy now but it'll get sane eventually. Looks promising but lacks of additional information. They used technical word that I do not understand. amazing post and useful crypto news..
Just IDK a part of me says to never touch a ICO ever again :/ I am pretty sure here in the states it is illegal to do so or near impossible to claim when it comes to tax time. Cardstack it's very good Technologies! Well done To the moon! Congratulations @kingscrown, this post is the second most rewarded post (based on pending payouts) in the last 12 hours written by a Hero account holder (accounts that hold between 10 and 100 Mega Vests). The total number of posts by Hero account holders during this period was 384 and the total pending payments to posts in this category was $8913.21. To see the full list of highest paid posts across all accounts categories, click here. This post has received a 12.53% upvote from thanks to: @kingscrown. Send minimum 0.050 SBD/STEEM to bid for votes. I dont have anu idea about this topic. There are many words(aggregation protocol)(ecosystem token) that i heard first time.Would you mind to give me brief idea about this word. Do you guys think that big exchanges will take interest on this? I hoped this project helped me a lot to pumped my investment because now is going down but I don't lose hope. The video sums it all. 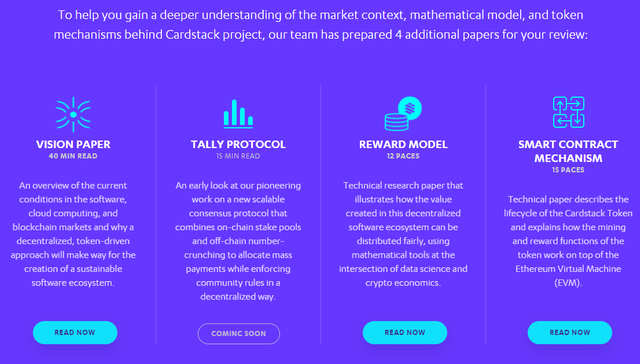 I mean If this project will work a lot of people will definitely use Cardstack because it can my our life easier. It's job friendly as well. very valuable your information @kingscrown thanks for sharing.